Café Connect is hosting a special event to celebrate Mother’s Day on Sunday 11 March. 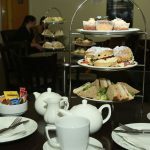 Located at the heart of the Acklam Green Centre, Café Connect will be serving an indulgent afternoon tea, so that people can treat their mums and other special ladies in their life. The mouth-watering menu comprises of finger sandwiches, homemade scones, a selection of cakes and a choice of tea, coffee or herbal tea. Guests will be able to pre-order an individual choice of sandwich fillings and scones and can choose from a Traditional Afternoon Tea or a Prosecco Afternoon Tea with an added glass of fizz to mark the occasion. Melanie Owen, Café Connect, said: “Everyone loves an afternoon tea, especially on Mother’s Day, so we have decided to mark the occasion by hosting a special event on the day so people can treat the special ladies in their life. “Our afternoon teas can be booked weekdays throughout the year and have proved popular with individuals and organised groups alike. We will soon be offering afternoon tea vouchers too which are an ideal gift. The Mother’s Day afternoon tea is priced at £6.50 per person or £12 for two with the prosecco option priced at £10.50 per person or £20 for two. It will be served between 12pm and 3pm on Sunday 11 March and places must be booked in advance by Wednesday 07 March, 2018. Individual menu choices and any special dietary requirements must also be confirmed by this date. To book please call the centre weekdays 9am – 5.30pm on 01642 811 120. Acklam Green Centre hosted an event for the local community, as part of the rollout of Middlesbrough Council’s public access defibrillator network. The business and community centre invited people along to a special launch event in the centre on Friday 5th January to introduce them to their local defibrillator, which is located on the exterior of the building. The event included mini demonstrations from the North-East Ambulance Service (NEAS) and there was also an opportunity for members of the community to sign-up for free training with more in-depth knowledge of CPR and using a defibrillator. Acklam Green Centre took the opportunity to extend the event by inviting a number of local organisations to give out advice and information to help people start 2018 on a healthy and positive note. Organisations who attended included; Actes a charitable company which delivers a wide range of services to help people improve their lives, Age UK Teesside, Middlesbrough and Stockton Mind, Ageing Better Middlesbrough, Healthwatch, Middlesbrough Environment City and Everyone Active, who ran taster sessions of New Age Bowls and Frisbee Golf to promote physical exercise for all. In addition, a nurse and Health Care Advisor carried out a number of Healthy Heart Checks for those aged 40-74 and mini-health checks for people aged 25-39. Donna Smith, facilities manager at Acklam Green Centre, said: “We are delighted that Acklam Green Centre was chosen by Middlesbrough Council to be fitted with a public access defibrillator as part of the rollout of the borough-wide public-access defibrillator network. 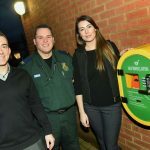 Cllr Julia Rostron, Middlesbrough Council’s Executive Member for Adult Social Care and Public Health, said: “Clearly it is stating the obvious but defibrillators save lives and therefore having a network of them across our communities in Middlesbrough, accessible to all, is a very positive thing to do.